The year of the Monkey has not been kind to us. The mischievous monkey has left a trail of unfortunate events in its wake as it streaked through the year. 2016 was a difficult year, marked by the burden of rising prices, a weakening ringgit, continuing revelations of the 1MDB and other mega corruption scandals, tightening government controls over our democratic freedoms, among others. On a more personal level, my party members and I were shocked and saddened by the brutal shooting of Bill Kayong in June, and in December, the native community was dealt a devastating blow by the Federal Court in the TR Sandah judgment. The tail end of the Monkey Year saw the Chief Minister’s passing, bringing the year to a solemn close. The Chinese anticipate the coming of the Rooster with gladness, for the loud crow of the Rooster heralds a new dawn, scaring away the negative and mischievous energies that have troubled us over the past year. Among the characteristics of the Rooster are the virtues of courage, trustworthiness and benevolence, and we look towards a new year in which these attributes abound around us. Courage to stand up and fight for what is right and just, to shift one’s mindset to make the changes that are necessary for our nation to progress; to place only trustworthy leaders to lead us out of the crisis this country is facing, so that we will have a government that is truly benevolent towards the people. The chicken/rooster holds special significance for the indigenous people of Sarawak. Besides signaling the start of a new day with the rooster’s crowing, chickens play a huge part in the rituals of the Dayaks from celebration to propitiation. For them, the hope this year is that the Rooster will bring a new era of leaders who will be brave enough to pursue the agenda that had been set by the late Adenan Satem but yet to be realized. Their hope is that the leaders will amend the law to recognize pemakai menoa and pulau galau as NCR. For all Sarawakians, the wish is that our leaders will set themselves apart from the crop of corrupt and self-serving politicians and speak up against corruption, injustice, religious discrimination and extremism. There is much to be done to combat poverty in the rural areas, and to deliver/ improve healthcare, education, infrastructure and development to all. May the year of the Fire Rooster herald the dawn of a brave new world for Sarawak. I wish all my Chinese friends Gōng Xǐ Fā Cái. Baru (centre) speaking during the press conference after chairing the state PKR leadership council meeting yesterday. From the left are Abdul Jalil and state PKR vice-chairman See Chee How. KUCHING: Parti Keadilan Rakyat (PKR) has announced that it will not stand in the Tanjong Datu by-election that will be held following the demise of its incumbent Datuk Patinggi Tan Sri Adenan Satem. Its state chairman Baru Bian said this was a unanimous decision made by the state PKR leadership council, as a gesture to let new Chief Minister Datuk Amar Abang Johari Tun Openg and the state government continue implementing the vision and policy Adenan made for Sarawak while he was chief minister. “We in PKR do realise and recognise the stand made by our late Chief Minister (Adenan). We are together with him in the various stands he made, in particular he rekindled the hope of Sarawakians after assuming the post of Chief Minister. “In fact, he even revitalised the Sarawakian dream. He stood firm against the federal government in reclaiming our rights under Malaysia Agreement 1963. He had made very clear on issues of freedom of religion, recognising English as one of the main mediums of instruction in Sarawak and others. “We find that these are consistent with our own vision, dreams and manifesto. In particular, it is consistent with the Kuching Declaration which we prepared in 2012 as Pakatan Rakyat Manifesto before the 13th General Election (GE13). Because of all these, we feel that we should not stand in Tanjong Datu,” Baru said in a press conference after chairing a state PKR leadership council meeting here yesterday. He said the party also recognised the fact that Adenan had wanted to meet the leaders of all communities to find solutions to native customary rights (NCR) over land, especially in view of the Federal Court’s decision on Tuai Rumah Sandah’s case recently. Considering that the stands made by Adenan were the aspirations of all Sarawakians, Baru said his party would like to see them implemented by Abang Johari’s administration “in the coming months, year or even years to come”. “We really hope that he (Abang Johari) is doing his very best to fulfil Adenan’s vision and policy. He (Abang Johari) has done a very good job in his first press conference when he mentioned publicly that he will pursue the vision of our late chief minister. Apart from giving Abang Johari the opportunity to implement Adenan’s policy, the state PKR leadership council was of the view that they should focus on the 14th General Election. Baru stressed that the national PKR leadership had left this decision to the state PKR leadership council and therefore, they were not subjecting themselves to the approval of the national leadership on this issue. To a question, Baru said although PKR decided not to contest in Tanjong Datu by-election, the party could not stop or discourage anybody or any party from standing there. Since PKR had decided not to stand in Tanjong Datu by-election, the party would also not be taking part in the campaign by any individuals or parties contesting in the by-election, adding that it would be contradictory to the party’s stand and principle if they participate in the election campaign, Baru said. The Election Commission (EC) announced Feb 18 as the by-election date for Tanjong Datu. Nomination of candidates will be held on Feb 4, while early voting will take place on Feb 12. Baru, during the press conference, also announced Abdul Jalil Bujang as the new state PKR deputy chairman as his predecessor Abang Zulkifli Abang Engkeh had decided to step down after the last state election. Deputy Chief Minister Douglas Uggah Embas says he will meet Abang Johari in the next few days to discuss the matter raised by the Dayak community. 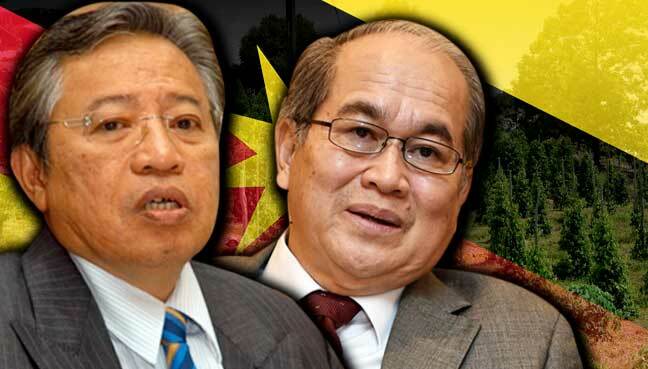 KUCHING: New Sarawak Chief Minister Abang Johari Openg and his deputy Douglas Uggah Embas will discuss matters concerning native customary rights (NCR) land in the next few days. Abang Johari had told reporters after chairing a PBB supreme council meeting on Saturday that former chief minister Adenan Satem’s last words to him and Uggah were to look after the state and to settle the NCR land problem. Uggah had earlier been tasked by Adenan to work on resolving the NCR land issue. Asked about this yesterday, Uggah said he would discuss with Abang Johari how to proceed on the matter. “We had some discussion yesterday (Monday) and within these few days I will discuss it with Chief Minister Datuk Amar Abang Johari. “I will then let you know what the next step is,” The Borneo Post quoted Uggah as saying after visiting the Swee Kee Marine Sdn Bhd ice and fish landing facility in Muara Tebas yesterday. The report said Uggah replied in the negative when asked if he had received any memorandum concerning NCR issues, particularly on “pemakai menua” (territorial domain) and “pulau galau” (communal forest reserve). Several groups have been holding meetings and forums to discuss this issue and making calls on the Sarawak government to resolve it. Before his death on Jan 11, Adenan had said he wanted to meet Dayak leaders to resolve the NCR land issue, particularly that over “pemakai menua” and “pulau galau”. A Federal Court ruling on Dec 19 last year that both “pemakai menua” and “pulau galau” had no force of law in Sarawak caused an uproar among the Dayak community and politicians began making various calls for action. The announcement of the new Chief Minister today is welcome news. We appreciate the fact that the appointment was made without delay to ensure continuing smooth administration of the state and to avoid speculations. Datuk Amar Abang Johari is an experienced leader, being a nine-term assemblyman. I believe he has come to understand the matters that are of great concern to the people of Sarawak from what Tan Sri Adenan Satem had prioritised, which gave him the popular vote from Sarawakians. We hope he will continue where the late Chief Minister left off and forge ahead with issues that were close to Adenan Satem’s heart, such as autonomy, petroleum royalty, education and illegal logging, just to name a few. In particular, we are optimistic that he will maintain our right to freedom of religion as championed by Adenan Satem and also pursue the NCR land issue that has been burdening the native communities. We call upon him, as one of his first acts in office, to ensure that the Land Code is amended to incorporate the concept of pemakai menoa and pulau galau as NCR land. This will be a very meaningful and momentous start to his role as Chief Minister of Sarawak, and signal to the people that he truly has their interests at heart. On a personal level, I have always found Abang Johari to be very approachable and I look forward to working together with him for a better Sarawak. The appointment of Datuk Amar Abang Johari augurs well for the political stability of Sarawak. My party members and I offer our heartiest congratulations to the new Chief Minister of Sarawak. The Court of Appeal today ruled that voters cannot get information from the Election Commission over how it arrived on the process of redelineation. In an unanimous decision, the appellate court in Putrajaya also ruled that lawyer and activist Haris Ibrahim had not pleaded how his rights would be infringed by the EC's decision. Justice Zamani A Rahim who wrote the judgment said the absence of federal legislation regarding freedom of information compared to in India and Canada also resulted in such information cannot be given. "Based on the above, (Haris') appeal is without merit and should be refused. It is a challenge to the constitutional duties of the EC as specified under Article 113 of the Federal Constitution," he said. “There is nothing in both the Federal Constitution and the Election Act 1958 or other express statutory provisions which require the respondent (EC) to do what the appellant is asking for from the court,” he said. Justice Tengku Maimun Tuan Mat, who led the panel that also consisted of Justice Ahmadi Asnawi and Justice Zamani, made no order as to costs. The court made the decision despite Haris' lawyers telling the court that their client had a right to freedom of information based on his right on Article 10 regarding freedom of expression. Haris told reporters with the decision today what it meant is that the people must continue to pressure with reforms of the various institutions including EC. He said he will seek advice over the next course of action on whether to appeal to the Federal Court. The lawyer and activist said the result of redelineation is that in his constituency of Petaling Jaya Selatan, which originally had 90,000 voters, would now become Petaling Jaya with about 150,000 voters. "My votes are now diluted as a result of this", he said, adding his constituency of PJ Selatan and Bukit Gasing state seat, had seen Taman Medan and Seri Setia entering into his constituency. Lawyer Malik Imtiaz Sarwar appeared for Haris while senior federal counsel Suzana Atan appeared for EC. Malik said the decision today may have a bearing on other existing challenges on the present EC redelineation exercise in Peninsular Malaysia. At present there are several people including politicians like Lembah Pantai MP Nurul Izzah Anwar who had filed a judicial review application to challenge the EC redelineation. “Don't tell me that the voters are wrong and they have no right to ask EC to provide the information,” he said. “If we look at India, the largest democracy with 600 million voters, their commission's website provides all the information that one seek for including the maps, the number of voters and others. "However, in Malaysia with our EC, we cannot ask for the information and when we ask the court, we are also unsuccessful," he said. "It is truly troubling that we are in the 21st century, and the EC can shove anything down our throat and we are expected to keep quiet, he said. The activist added that he liked Pandan MP, Rafizi Ramli's Invoke initiative and hence, was supporting it by delivering a talk in Johor. Malik had in last October in Haris' appeal, told the court that EC must furnish details of how it arrived at a decision to redelineate certain areas to explain how come some constituencies having bigger number of voters, with some even seeing a ten-fold increase, while others less. This was despite the Federal Constitution stating that the electoral body should ensure there is at least an equal number of voters in each constituency, he pointed out. It was reported two years ago that the Kuala Lumpur High Court had dismissed Haris' application to compel the EC to furnish details of the redelineation exercise for all constituencies in its website. The High Court judge ruled that Haris did not have the locus standi (legal standing) to initiate this originating summons to compel the EC to provide details of other constituencies. The Australian Federal Police (AFP) said today they are working with international law enforcement agencies to investigate companies associated with Malaysia's scandal-hit sovereign wealth fund. 1Malaysia Development Bhd (1MDB), founded by Prime Minister Najib Abdul Razak, is the subject of money-laundering investigations in at least six other countries, including Switzerland, Singapore and the United States. Civil lawsuits filed by the US Department of Justice allege more than US$3.5 billion was misappropriated from 1MDB. The lawsuits seek to seize US$1 billion in assets allegedly siphoned off from 1MDB and diverted into luxury real estate in New York, Beverly Hills and London, valuable paintings and a private jet. Najib, who also chaired 1MDB's advisory board, has denied wrongdoing and said Malaysia would cooperate with international investigations. 1MDB has also denied wrongdoing. "As the AFP continues to evaluate these allegations, it would not be appropriate to provide any further comment at this time," it said. The AFP did not respond to Reuters' questions about reports they were investigating on whether any financial gains from the scandal were in Australia or with which international agencies it was working. Singapore prosecutors filed 16 charges last week against the former local branch manager of Swiss-based Falcon Private Bank AG as part of their investigations into 1MDB. Authorities in the city-state jailed two former bankers from Swiss wealth manager BSI last year on several charges, including forgery and failure to disclose suspicious transactions involving Jho Low. KUCHING: Ba Kelalan assemblyman Baru Bian wants the condition of the Accident and Emergency (A&E) Department at Sarawak General Hospital (SGH) here be improved further. The state PKR chairman said he was at the unit last week when one of his relatives was admitted for treatment. “The experience left me feeling grateful and sad at the same time. (I’m) grateful and full of admiration for the doctors, nurses and staff members who work incredibly hard – and sad that they are required to work in such a challenging environment,” he said in a press statement yesterday. He observed that there were people standing around there, waiting anxiously for updates on their relatives who had been taken into the restricted waiting area. According to Baru, the A&E Department is an area that needs special attention from the government, as it is a place of life or death, saying ‘more often than not, everyone wants life to be the outcome’. Baru said people could expect that with the worsening economy and depreciated purchasing power of the ringgit, more and more people who previously went to private healthcare facilities would turn to public hospitals. He said if based on the statement by Deputy Health Minister Datuk Seri Dr Hilmi Yahaya in October last year, who said the rate of visits to public healthcare services had increased and the record was higher than that registered the year before, he wondered how much more the A&E could cope with before reaching the breaking point. “In the last State Legislative Assembly (DUN) sitting, we were informed that as at Oct 31, 2016, the progress of Petra Jaya Hospital (project) was 42.51 per cent towards completion, when it should have been 78.18 per cent. “On Oct 13, 2016, State Health Department director Dr Jamilah Hashim was reported to have said that the new completion date would be June 2017. Two days later, the Public Works Department headquarters in Kuala Lumpur was reported to have revealed that the contractor had committed to completing the project by the end of 2017 – it’s expected that the contractor would apply for another extension. Meanwhile, Baru said he had been informed that plans for the new parking block at SGH included a better and more spacious A&E unit on one of the floors. In the meantime, Baru said the A&E at the SGH was in need of ‘some emergency help’ itself and as such, he called upon the government to provide some relief to them pending the delivery of the Petra Jaya Hospital and the extension of the SGH. Two of the four accused in the murder of Bill Kayong – Datuk Stephen Lee (wearing mask, second left) and Chin Wui Chung (left) being escorted by police to the police truck after the mention of the case at the High Court yesterday. MIRI: The Miri High Court yesterday postponed the case mention of the four accused in the murder of PKR secretary, Bill Kayong. Judicial Commissioner Dr Alwi Abdul Wahab made the decision after Ranbir Singh Sangha, the defence counsel for the accused, wanted the presiding judge to recuse himself from hearing the case. Ranbir, the defence counsel for the first accused Mohamad Fitri Pauzi and second accused Lie Chang Loon, said a letter dated Jan 3, 2017 was addressed to Chief Judge of Sabah and Sarawak Tan Sri Richard Malanjum, requesting for a new judge to hear the case. Ranbir, however, did not inform the court the reason for the request to change to a new judge. Alwi had not fixed the new date for further mention of the case as it might be heard by the new judge. Deputy public prosecutor Kamal Baharin Omar appeared for the prosecution. Businessman Datuk Stephen Lee Chee Kiang, 45, Lee’s personal assistant Chin Wui Chung, 50, and pub owner Lie Chang Loon,37, claimed trial to abetting bouncer Mohamad Fitri, 29, in murdering Bill, whose Muslim name was Mohd Hasbie Abdullah. They allegedly committed the offence at the traffic light intersection near E-Mart Supermarket at the Jalan Kuala Baram bypass around 8.20am on June 21, 2016. They were charged under Section 109, read together with Section 302 of the Penal Code, which carries the mandatory death sentence upon conviction.